My wife, Chaitanya suvvari, age 28 years, is diagnosed with blood cancer(AML) and is undergoing treatment in Vellore CMC hospital. The funds would be used for the bone marrow transplanation. The procedure will start in 10 days. Please reach me for any questions. 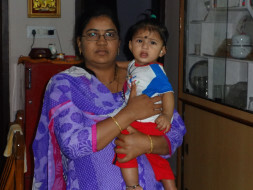 Chaitanya's Bone Marrow Transplant (BMT) was done in the month of August. Unfortunately, it is not fully successful. Her Bone marrow is not producing the cells. So again she is undergoing Chemo and she may need another BMT in 2 months. This time we are trying for 100% matching stem cells through donars. Will get back to you with the estimation copy from the doctor soon. We need all your support and prayers. Chaitanya's Bone Marrow Transplant (BMT) is planned on August 1st 2015. Her sister's stem cells are only half match for the transpalnt. So we are proceeding with her brother's stem cells. By God's grace and by all your support we got sufficient funds for her BMT. Please pray for her recovery. Will update you all once the BMT is done. Thankyou is a very small word that i can tell to all those who contributed and praying for my wife. No words to show our gratitude for all your endless support. We are very happy to note that, there are many wellwishers through out the world who are praying for her quick recovery. Her BMT is scheduled on July 10th , 2015. Please pray and share this link.